" We hope foreign tourists visit to Seribu Islands could increase"
Eight Saudi Arabian journalists are exploring North Seribu Islands tourist destinations, Thursday (12/20). Those journalists were welcomed by Seribu Islands Regent, Husein Murad at Marina Ancol Port 17, North Jakarta. 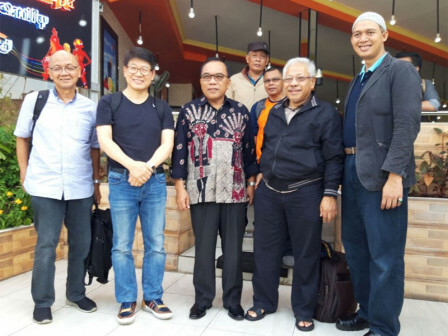 "In this tourism destination exploration to North Seribu Islands, they visit Macan Island and several maritime and cultural tourist destinations in Seribu Islands," conveyed Husein Murad, Seribu Islands Regent, Thursday (12/20). He informed, these guests are staying in Macan Island and slated to explore beaches and underwater scenery nea r Macan Island, such as in Pantara Island, Genteng Island, Sepa Island, Putri Island, Matahari Island, and Pelangi Island. "From foreign media visit and publication abroad, we hope foreign tourists visit to Seribu Islands could increase," he mentioned.